Li Binyuan, Deathless Love. 2015. © University of Salford Art Collection. Brief biography: b. 1985, Yongzhou, China. Lives and works in Beijing. 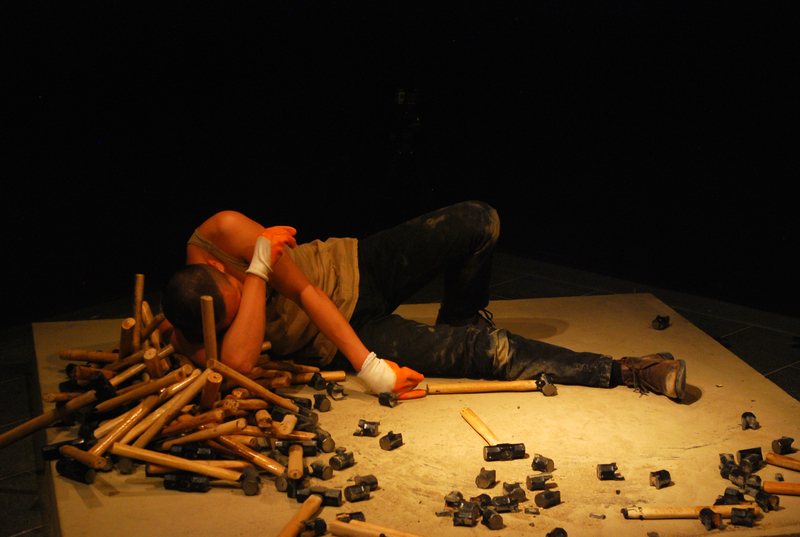 Binyuan’s practice spans sculpture, video and performance – often intervening in urban spaces. His works question the boundaries of performance, intervention and documentation; and considers the body as art object. 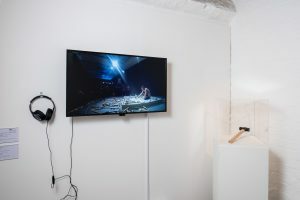 Through his performances, Binyuan invites viewers to reconsider appropriate and legitimate boundaries, and the futility – or not – of action and counter-action within social settings. Deathless Love was performed to a live audience at Centre for Chinese Contemporary Art (CFCCA) during Manchester After Hours 2015, a citywide evening celebration of Manchester’s culture. Binyuan sat on a rectangular concrete plinth, surrounded by around 100 hammers that he then destroyed using only the other hammers and his own physical strength. The endurance performance continued until all the hammers except the last, were broken. The performance, which premiered in Beijing in 2012, interrogates ideas of artistic labour and production, the body as sculpture, and themes of repetition and reaction. The 2015 performance was commissioned by University of Salford Art Collection as part of his solo exhibition Social Behaviours at CFCCA, which explored Binyuan’s sense of humour, expression and provocation and maverick, anarchic and irreverent approaches. The acquisition includes a specially commissioned film (in single channel and five channel versions) of the live performance, as well as the last remaining hammer. The film commission was produced by Steve McWade, a North West based artist and musician whose practice explores live performance, technology and interactive work. Li Binyuan, Deathless Love, 2015. Installation shot at St. George’s Hall. Photograph by Pete Carr. Recently Deathless Love has been exhibited in group shows: PRESENCE: A Window into Chinese Contemporary Art, Liverpool, UK (2018) and What’s in Store?, Salford Museum & Art Gallery, Manchester, UK (2017).